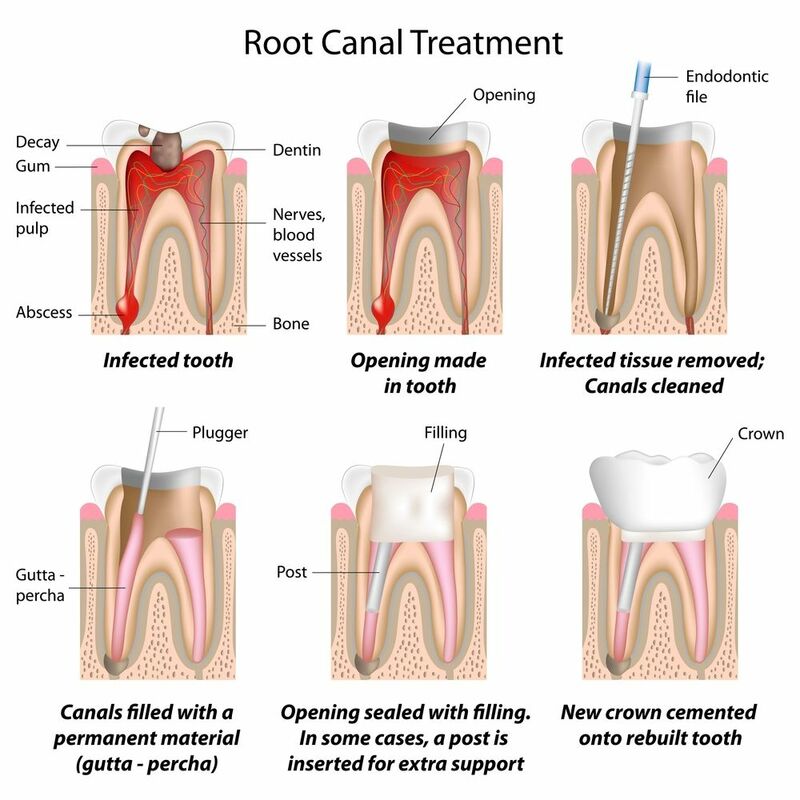 ​What is Root Canal Treatment? Most of us know what a filling entails, but have little knowledge of RCT treatment, so here’s the run down from Centre for Dentistry, the dental practice in Sainsbury's. Root Canal Treatment, also known as endodontic treatment, is needed when the pulp of the tooth (that is the blood/nerve supply) is infected through decay or injury. In some cases your tooth may darken in colour, which could mean that the nerve (blood supply to the tooth) is dying. It’s important to know that you may not have any symptoms in the early stages of infection, so it’s not a case of ‘one size fits all’ when it comes to tooth decay. If the pulp of the tooth becomes infected it will spread through the root canal of the tooth, and will eventually lead to an abscess. Pain from an abscess can come and go and antibiotics will only temporarily alleviate the pain; they also create resistant strains that can make them less effective with each use causing more problems later on. It is best to treat the tooth rather than rely on repeated use of antibiotics. If root canal treatment doesn’t take place and the infection is left untreated the tooth may have to be taken out. Large abscesses destroy the bone around them limiting restorative options after the extraction. The aim of a root canal is not only to remove all infection from the tooth, but also to sterilise and completely fill the canal space with inert material. Infected pulp is removed and any abscesses can be drained. Then the dentist will clean and disinfect the tooth and place temporary filling before leaving the tooth to settle. At the second appointment the tooth is checked and when all infection has cleared the tooth is permanently filled with a rubber-like substance called “Gutta-percha” and a permanent filling. Sometimes it is possible to do an RCT in one appointment- this is not poor dentistry, and depends on how the tooth is after the first stage is completed; it may not be necessary to leave the tooth to settle. Very challenging cases may be referred to an Endodontic specialist. Teeth that have undergone root canal treatment usually have large amounts of missing tooth structure – your dentist may suggest a crown to strengthen and support the tooth. This procedure should feel no different to having an ordinary filling done. Sometimes there is some tenderness afterwards but this should gradually decrease with time. When there is not enough tooth substance present to hold a restoration (such as a crown), a dentist might recommend an RCT treatment of the pulp of the tooth, followed by a “post and core” where the pulp is replaced by a metal post so that the tooth can hold the crown. In some cases a root canal can fail and need retreatment, sometimes years after the procedure. This can happen for a variety of reasons; your dentist will be able to explain to you why this has happened and the best course of action. Please contact your local CFD practice for more information. See below. We provide general, cosmetic and specialist dentistry including implants and orthodontics. Our dentists can converse in a number of languages, including Arabic. Welcome to Centre for Dentistry, your local dentist in Fulham - we're inside Sainsbury's! Centre for Dentistry provides a full range of dental services - from an every day check-up to orthodontics and implants – and are open 6 days a week. Are you looking for a dentist in Camberley? Centre for Dentistry offers a full range of dental services and excellent patient care. Find us in Sainsbury's. Welcome to a new type of Dentist, Centre for Dentistry inside Sainsbury’s Rayleigh Weir, Benfleet. Looking for a dentist in Brighton? Visit Centre for Dentistry in your local Sainsbury's store - convenient, with excellent patient care & great value. Centre for Dentistry Chichester can be found in Sainsbury's. Welcome to Centre for Dentistry in Fosse Park, Enderby, Leicester. Here, great patient care comes first. Whether you are a regular or havent been in years, it doesn't matter. Welcome to Centre for Dentistry inside Sainsbury’s Christchurch. A brand new, state of the art dental practice located within Sainsbury's store, here at Sainsburys Centre for Dentistry (Tamworth) we can offer you a full range of dental services, 7 days a week. Patient care is at the heart of everything we do. Visit our modern surgeries for a range of high quality routine and specialist dental treatments. Are you looking for a new dentist in the West Midlands? We can a full range of dental services from simple remedial work, to the more complex treatments such as root canal therapy and dental implants. Are you looking for a new dentist in Sheffield? Are you looking for a top notch dentist in Welwyn Garden City? Centre for Dentistry offers great dental care at affordable prices and we aim to make your visit to the dentist easy and enjoyable. Find us inside Sainsbury's.